On Sunday 21st April 2019 the sun will rise at 05:55 and will set at 20:27. It will be a mild day, with temperatures reaching around 19.9°C. Today is expected to be a dry day, with a very low chance of rain. It will be quite a breezy day, with a maximum expected wind speed of 13mph. On Monday 22nd April 2019 the sun will rise at 05:53 and will set at 20:29. It will be a mild day, with temperatures reaching around 20.9°C. Today is expected to be a dry day, with a very low chance of rain. It will be quite a breezy day, with a maximum expected wind speed of 23mph. On Tuesday 23rd April 2019 the sun will rise at 05:51 and will set at 20:31. It will be a mild day, with temperatures reaching around 18.6°C. Today is expected to be a dry day, with a very low chance of rain. It will be quite a breezy day, with a maximum expected wind speed of 22mph. On Wednesday 24th April 2019 the sun will rise at 05:48 and will set at 20:33. It will be a mild day, with temperatures reaching around 13.9°C. A few showers are expected, 3mm of rainfall is possible today. It could be quite a gusty day today, with a maximum expected wind speed of 22mph. On Thursday 25th April 2019 the sun will rise at 05:46 and will set at 20:35. It will be a mild day, with temperatures reaching around 13°C. Some moderate to heavy rain is expected, 5mm of rainfall is possible today. It will be quite a breezy day, with a maximum expected wind speed of 22mph. On Friday 26th April 2019 the sun will rise at 05:44 and will set at 20:37. It will be a mild day, with temperatures reaching around 14.2°C. Today is expected to be a dry day, with a very low chance of rain. It will be quite a breezy day, with a maximum expected wind speed of 21mph. On Saturday 27th April 2019 the sun will rise at 05:41 and will set at 20:39. It will be a mild day, with temperatures reaching around 5.8°C. Today is expected to be a dry day, with a very low chance of rain. It will be quite a breezy day, with a maximum expected wind speed of 29mph. Welcome to urban adventure. We are a High ropes adventure centre in Bitts Park, Carlisle. We bring an exciting mix of thrill seeking and personal development to those who like an adventure . 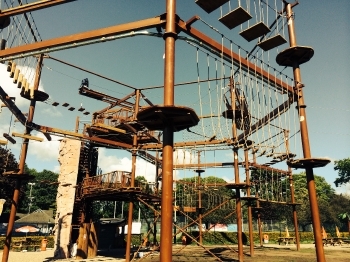 The site combines the following activities: High Ropes courses at 4m and 8m, a 75m Zip wire, Climbing wall, Power fan Descender, team building area and an innovative kids adventure course for the littlest Adventurers. With a range of activities to suit everyone from children to adults, you'll be sure of an action-packed and exhilarating visit to Urban Adventure in Cumbria.